You do need to be running an old kernel of course, I think I was using Backtrack 5 in that video. I have a custom distro dedicated just for this card since it hasn’t been updated in so long and I wouldn’t know the first thing about bringing it back up to date. Dialog Semiconductor has some DECT stuff targeting IoT applications (https://www.dialog-semiconductor.com/products/smartpulse) although there doesn’t seem to be much on the market even in Europe. The only thing I’ve seen other than phones and baby monitors is a version of the Eurotronic Comet thermostatic radiator valve, and it isn’t particularly clear what you’re supposed to connect it to! Ericsson was one of the pioneers. Siemens had a DECT-Set for a serial Link, the Gigaset M101 Data. I used it before Wifi and DSL to replace the long phone line through the flat (one Gigaset and modem next to phone, other Gigaset connected to computer). Well, networking equipment manufacturer AVM uses it for Home automation. See https://avm.de/ratgeber/smart-home/heizkosten-reduzieren-mit-fritzbox-und-fritzdect-300/ as an example. That is no surprise as they produce the line of FritzBox routers/modems which are quite popular in Germany and more often then not contain a DECT base station. Worked for Olivetti during that time. I was lucky enough to have most of the latest technology/products on my desk or on that of my colleagues nearby. 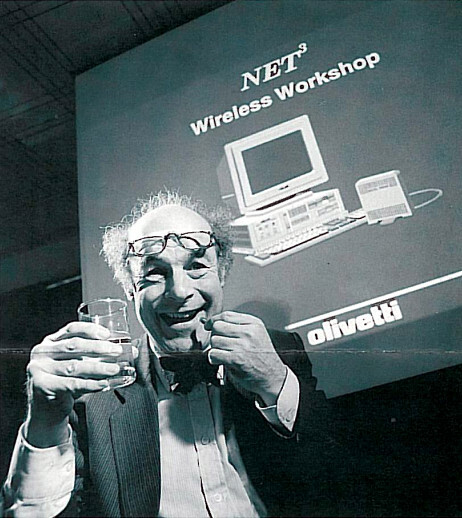 What I can say about the net3: I don’t remember it… The thing with Olivetti is that although they developed some very innovative and good products, marketing was not their strongest point and the information did not spread. Some of the things I remember: – The not so portable M18P and M21 computers. – The Quaderno (1992) was a A5 footprint notebook that was effectively useable on batteries and not just a prototype but mass produced (it was XT compatible and weighted only 1kg). – They also made the first inkjet technology printers (HP purchased/licensed that thing from them). – Back in 1990 they had a multi-head harddisk storage on SCSI (what one would call a SAN today). – The Envision multimedia computers. – Any so much more. I remember the Quaderno, and there was a time when everyone had an Olivetti inkjet. Easy error to make, these annotations are more cryptic than… Well, the Apple SEP now, among other things. Yepp. Indeed, both numbers are wrong. That is, if you agree on the same definition for bits (b, bit), bytes (B) and the binary (Ki, Mi, Gi, Ti, Pi, Ei) and decimal (k, M, G, T, P, E) unit prefixes that the industry and scientific community, especially the international standards bodies agree upon. I guess it is a good thing that it is my freedom to interpret a different meaning to the words I read or hear, like using a compromise between 1000 and 1024 as a universal unit prefix (thanks for the XKCD link!). But then again, I have to imagine a certain blond individual actually having the power to enact, by decree, an even different interpretation as a law or something.. The Orange-utan’s next soap box: Enacting the hard-drive manufacturer’s kilobyte as a function of US law. I tend to be somewhat lax on the 2^10 vs 10^3 numbering, as the number i’m throwing around are usually sloppy estimates. I usually only elaborate when there’s a need to extinguish all possible ambiguity. In the US one of the primary desirable features of DECT is that it’s on a frequency band that isn’t used for everything like 2.4ghz and doesn’t have the penetration problems of 5ghz. Admittedly cordless phones aren’t much of a loss these days but I’d still be kinda pissed if I had to dig up an old 27mhz system or something because IOT vendors decided the DECT band was the new hot place to stick their overcomplicated unsecured lighbulbs. I’m still rockin’ a LaserJet 4 plus, presumably manufactured in May 1994. Replaced laser diode module (it fried), and replaced all rollers (fuser still seems in good shape, perhaps it was replaced), belts, and few gears. Still churns out pages when asked. With 36MB RAM, it seems to keep up with pretty much any modern (consumer) 600dpi black-and-white laser printer i’ve seen. It’s the curse of Italian engineering. We build stuff, we even market and sell stuff, but usually a foreigner has to come in a few years later to actually properly invent it… Also see Bell vs. Meucci. Panasonic has few home automation products that runs on DECT. They call it Home Monitoring Network. I own a full set which acquired for 100$ including 4 cameras. Main intention was hacking it when I bought it but I find little to no information on the technology and their products. Main hub seems to be well protected for network hacks so only solution is to hack the DECT and directly communicate with all the sensors :). However I dont recommend the panasonic system for anyone even if you find the full set for 100 or less (poor software quality). Unless we manage to hack it use it with something like Openhab.